By Rubies, This Bobba fett collectors helmet is perfect for a fan of the star wars movies. 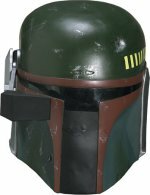 Become the bounty hunter bobba fett mainly featured in star wars episode 6 return of the jedi with this magnificent replica. This helmet comes with battle damage features.